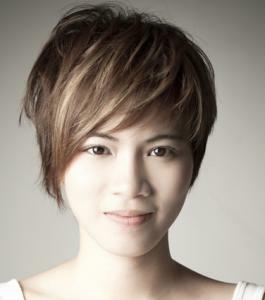 A pixie cut is one of those great haircuts that can be styled several different ways. Whether your cut is on the short or long side of a pixie, you can always change up your look by adjusting the way you style it. By simply changing where you part your hair or by styling it with different products, you can get a completely new look with your current cut. There are several simple ways to change up the style of your pixie cut. Experiment with these options. To create this style, you will need a medium round brush, a hair dryer, root texturizer, and shine spray or gloss. Apply root texturizer to damp hair. Dry the hair with a medium round brush, and pull up and away at the root for volume. Part the hair with a deep side part. Finish your style with shine spray or gloss for a perfect, polished look. This style works great with second-day hair. All you need is a flat iron and some pomade or hair wax. Starting at the crown, flat iron all of your hair forward. Flat iron your bangs to the side you wear them on while still bringing the hair forward. Apply a dime-sized amount of pomade or hair wax to your palm and rub well between both hands, including between your fingers. Use your fingers to tousle the style, adding texture by pinching and twisting the ends. Smooth the hair down from your crown to the nape of your neck using the remaining product on your hands. For this style, you need mousse or root lifter, a hair dryer, a large barrel curling iron, and firm hold hairspray. Apply mouse or root lifter to your to damp hair. Using your fingers, pull your hair up at the root while drying. Once dry, divide the top section into two-inch pieces and use the curling iron to curl each section away from your face. Allow your hair to cool for five minutes to lock in the volume. Break the curls up by running your fingers through them. Smooth the back down and tuck the sides behind your ears. Set your style with firm hold hairspray. You can always change up the style of a pixie cut by trying something different. Just switching up your part, bringing your hair away from or toward your face, or adding volume allows you to create a fun new look whenever you want.